I bought my .223 805 Bren carbine back in November and just had a chance to clean it and take it to the range. Loaded a 3rd gen Pmag, pulled the charging handle, pulled the trigger. Nada. Pulled the handle back and it had picked up a round from the magazine. I dropped the mag and cycled the round out and tried again. Same thing. Again, different mag, same thing. The bullets that were being picked up all had a pretty deep indentation in the side of the brass. So I left my rifle with the gunsmith at the range and they told me everything seemed fine with the 805, it just wasn't shooting. I'm not an experienced shooter, this is my first long arm, but I have been running a VP9 through many trips to the range no problem. I've never seen this one before and I don't know what could be causing it. Will probably try sending it off to CZ, but wondering if anyone else has had a similar experience. Any help would be greatly appreciated. Sorry if I'm not clear. Wish I had taken pictures of the rounds. The mag seemed seated, bullet was fed, the primer was not struck, there was an indentation on the lower third of the brass of the rounds. No rounds fired. I had to manually eject them. I'm going to go back to the range and try again with the metal mags that shipped with the rifle. If it does it with those I'll take pictures. I should add the indentation was on the side of the brass. It was not on the bottom. So I think that means the bullet was being partly fed and then being struck on the side which seems possibly dangerous to me. Hmm, that IS odd. I have used PMAGs with no issue before. Definitely try with the issued D&H mags and see if perhaps the mag release was holding it too high? Were the rounds fully chambered and did the striker go forward? Hear a "click" when trying to fire? Is this rifle new or "new to you"? In any case, I'd call CZ-USA at 1-800-955-4486 and ask the gunsmith. Weird, good luck, because these are awesome orphans. I believe I heard a click. This is a brand new rifle. Will be giving it a go with the issued mags next week and I'll give CZ a call if that doesn't sort things out. I want to love it, believe me. It's a beautiful big piece of machinery and I was really excited to take it out for the first time. Lots of magazines are "AR15" magazines. Lots of rifles use "AR15" magazines. Don't believe it's 100% true. I have a non AR15 that uses "AR15" magazines. Sort of. I take it to the range now and then (both heavier than my AR15's and less accurate, but I want to like it so I shoot it now and then). Did okay a few times and then one day it started dropping the magazines to the bench or the ground when the first round fired. I found out that some magazines will lock into the lower receiver and some won't. It's that tight/close inside that with some magazines the feed lips will contact the upper receiver before the mag. catch can move over and really lock the magazine into the lower. I had to go through a stack to find some that would lock in and I put them in the case with that rifle for any future range trips. I had an issue with a .22 conversion kit in my youngest son's AR15 that resulted in the bolt not completely moving into firing position. The trigger would release the hammer, the hammer would hit the back of the bolt and move it into "lock up" without firing the round in the chamber. Finally figured out the bolt was rubbing the right side feed lip on some of the magazines. That slowed the bolt down enough that it wouldn't always/every time move fully forward. Used a pocket knife to shave the top of the right side lip down on a couple of problem magazines and everything was good to go after that. 1) release the bolt from the locked back position and let the spring(s) move the bolt forward. Don't "ride" it with your hand/fingers to slow it down. Just let it go, that's what happens when it fires normally and it won't hurt anything to do that when chambering that first round from the magazine. 2) before you shoot it, take a look at the bolt through the ejection port and make sure it really is fully forward after it feeds that round. If the bolt isn't fully forward/locked up correctly it may be a design feature of the rifle that the hammer cannot strike the back end of the firing pin. My CZ85 had a case blow out one day (completely blew the base/rim off the case walls). Some people suggested an out of battery fire incident (primer ignited the powder before the barrel/slide were fully locked up). I took a good look at my CZ pistol and found that the hammer cannot hit the firing pin unless the slide is fully forward. The hammer will strike the bottom back corner of the slide (and not be able to hit the firing pin) unless the slide is fully forward (and locked up with the barrel.) It wouldn't surprise me a bit if CZ designed their rifles similarly as a safety feature. Good luck with it, they are neat looking rifles. I’m not trying to be funny but double check the mags and make sure they are in fact ar15 mags. I am in no way trying to question your intelligence...just make sure. Some of the Pmags look similar in my opinion. The gen3 Ar15 Pmags ran like a champ in mine today. Your post made me remember some threads off arfcom and other places. Something about small changes between the Gen 1, Gen 2 and Gen 3 PMags to make them work better with non-AR15 rifles/carbines. Definitely something to consider, if it's magazine related. I did check them and I tried a Pmag provided by the range as well. Like I said, I'll give it a try with the metal mags that shipped with it in a day or two. I'll take pics of what it's doing to the casings if it happens again. Might try really banging the mags in harder as well. They seemed seated fine but it being my first time I was probably a bit gentle with them. Hiya Gamestop and thx for the thread, I have the Bren run as a pistol, not many rounds thru it but never a issue. At the indoor range here,the report from it seems louder than the other things on the range. Fun to shoot. I hope ya brought out something else to shoot when the Bren didn't work. Saw that ya had the smith at the range assess that other than the gun not working that the guns fine. This made my brain hurt a little. Akin to dropping my car off at the shop only to return and hear, your cars fine,it just dosent run. What else did your smith say and how much do they charge to not fix a gun?? With what you described last week, and slamming the mag in harder this week for a possible remedy, thats really not gonna change your result, but could damage where the mag seats and or the mag. Our forum perhaps needs a sticky post specific to that fateful call to cz usa and its really nothing like have a root canal. Back on the 12th, customer service would have taken your info and likely emailed you the shipping labels and you'd prolly be getting you gun back fixed by a smith thats well trained in your Brens workings. They often provide some thanks for being a cz owner gift too. Be well. Allllright! Things are much better this time. Took another trip. The gunsmith wasn't around, but I was told they stripped it down, internals seemed fine, and they put about 15 rounds through my 805 without issue. Today I brought in a 40-round magpul pmag and the two metal mags that shipped with the gun. The mags that I left with the gunsmith were two 30-round generation 3 (iirc) magpul pmags with the window. Turns out the problem were those two magpul mags I had originally brought with the rifle. One of them seated loosely and the other one was not seating properly. Today, by forcefully seating, I was able to get one of the two mags to feed after one bad round. The other one I could not get to feed properly. Every mag I brought in today, including the 40-round Magpul mag (woo the rail was hot after I finished this one off), fed absolutely fine, with the metal mags also seating really nice and tight. So I thank everyone for their advice. Whoever suggested to keep trying mags, an extra thank you. 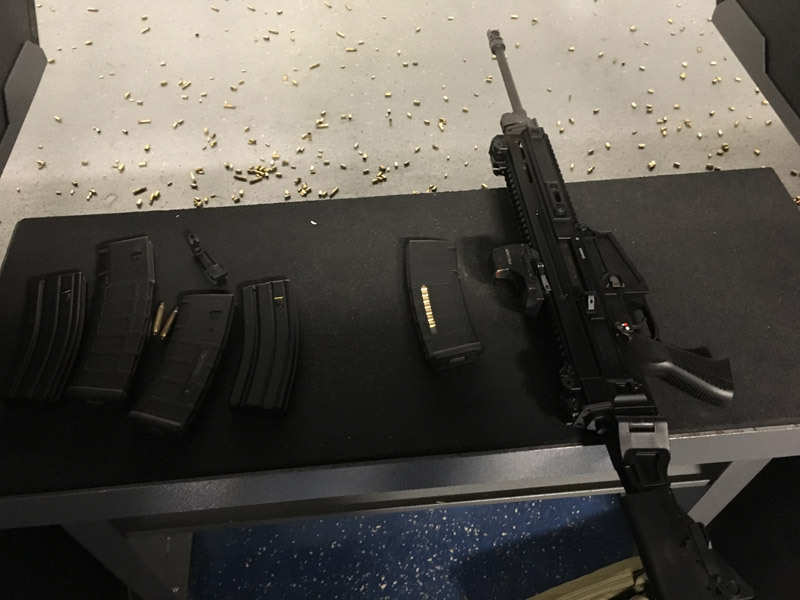 I had a lot of fun at the range. You can see the offending mag in the picture. It's the one that is still fully loaded. Probably just a fit thing between your rifle and the magazine. Trade it off (keep the ammo) to someone with a good metal magazine (test fire it first to make sure it works in your Bren) and you'll be ahead. Just for info, I usually buy my magazines (aluminum or Pmags) from Palmetto State Armory. Just got some of the Pmags for $8 each a month or so back. A couple years ago they had the aluminum magazines (30 round of course) made by D&H on sale for $7 each and I got a some of those, too. Ran out awhile back after distributing them among my sons and nephew for their AR's. Pmags went on sale first, so I got some of those. Just checked. PSA (Palmetto State Armory) has the aluminum D&H magazines for $8 each with free shipping if you order 10. The Pmags are on sale, too, but don't look to be as cheap right now. For a time I thought about buying used/abused GI surplus magazines at gun shows. Then buying new springs for them and anti tilt followers and maybe painting/coating them. It just doesn't add up. By the time you pay $7 or $8 a piece for a used magazine, the buy new springs/followers you've exceeded the $8 each for the new D&H mags. Anyway, good luck with it. Nice to have a rifle/handgun you feel you can really depend on. Thanks, I might pick up some aluminum mags from PSA. I'll keep that 40 round and the one 30 round pmag for trips to the range but I won't be depending on them in life saving situations. I think I just got a bit of youtube poisoning on this one where I watched people testing out mags on the bren and I assumed that I would have the same experience. Lesson learned. The D&H mags work beautifully, that's for certain. Glad to hear you got that resolved, had the same issue with a different mag.